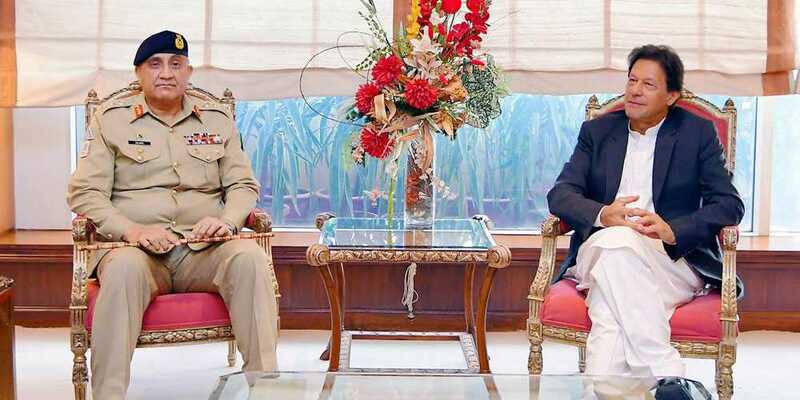 Chief of Army Staff (COAS) General Qamar Javed Bajwa Wednesday called on Prime Minister Imran Khan and discussed with him national security of the country among other affairs, a spokesman for the PM's office said. Besides national security, the spokesman said, the two figures also discussed professional affairs of the military. Sources informed Geo News that prime minister and army chief exchanged views on matters relating to ongoing anti-terrorism operations and national action plan (NAP). The progress with regard to Financial Action Task Force (FATF) requirements also came under discussion at the meeting, they said. Also, the premier and army chief discussed the visit of US special envoy Zalmay Khalilzad to Islamabad and Afghan peace process, the sources added. Earlier in the day, Khalilzad called on Khan and conveyed him best wishes from US President Donald Trump. “The US leadership is looking for a peaceful solution to the Afghanistan issue and mutual cooperation between the two sides,” he told the Pakistan premier.